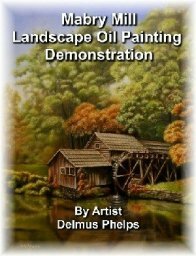 Oil painting basics, a great starting point in learning oil paints. So how do you start to oil paint? With these oil painting basics! Learn these oil painting basics, understand these underlying principles, and you won't go wrong with oil paint. Sometimes, as a beginner, these concepts are needed because you really don't know where to start. I'm going to try to put together a short page on some of the basics of oil painting so you can at least get started. If you've visited the Flemish Technique lessons navigation button (which discusses in detail the Flemish technique), you've gotten a very good start. But maybe, it was a little too much at one time for you. Hey, that's cool. We all gotta start somewhere, and you've clicked here because you want a better understanding of oil painting. I'll try not to disappoint you! If you like what you read, "like me" on the facebook application too! There are many methods to oil painting. Some are better than others. So how do you decide which process or technique to use? For me, it was to visit the museums. Understanding why some of the old paintings looked so much better than the newer ones, both in color and paint film (how it was physically holding up to age). The Flemish works of the world seem to always be on top. That's why it is the one I recommend. And why it is discussed first from my Navigation Bar on the left. But the site will explore others as they too have merit in helping the artist create works of wonder and beauty. If you adhere to a few simple rules when applying these other oil painting techniques, your works should last at least your lifetime! I only recommend the Flemish Technique, as it really seems to be the easiest to learn and get some really fantastic results. Don't believe me? Check out my "Your Oil Paintings" section for some first timers and their paintings! It opens in a new window so you won't lose your place here. So here's the very short list of oil painting basics to remember. More detailed descriptions are below on the page or links to other pages where available on the site. Paint on a suitable surface, one that has been prepared properly for Oil Paint. These are talking mainly about the materials and the handling of materials in oil painting. These next set of rules aren't really rules, but rather, subjects that would be discussed in any art form. From watercolors, acrylics, and oil painting. This is a principle of oil painting that when followed, your painting will remain intact. If not followed, your painting will crack. This happens when the drying layers dry at different rates. Your "fat" layers need to be on top. Your last layers painted. These simply have more "Oils" (fat) in them. Your earlier layers are "thin", usually thinned with turpentine or another solvent. Paints fresh from a tube are pretty "fat" and mixing them with an oil will make them "fatter" and will take longer to dry. That's why in earlier layers, your paint is usually thinned with a solvent. They dry faster, so you can get on with your painting sooner. This quicker drying (thinned) paint, if put over a fat layer of paint will create an unequal tension on the layer below. Because it shrinks faster, it will pull the lower layer apart. This process is fairly slow, and can't be seen right away. When I say drying time, oil paints don't actually "dry", but have a chemical reaction with oxygen that on the surface happens quickly, but further into the paint layer, takes decades. Certain paints will have a low oil content, and thus dry quickly. These would be your Prussian Blue or Burnt Umber. Others that seem to take forever to dry will be your Cadmium Yellows and Reds. Same concept as above, but in some techniques where heavy impasto passages are created, you need to remember this rule. The thicker layer of paint takes much longer to dry through and through, and the thinner layers will dry much sooner. Because of the tension created, a very thin layer over a thick layer will crack. (The thin layer dries first and shrinks, this shrinking will pull the underlying thick layer apart). Now having said these last 2 points, if these are done right, you shouldn't have any issues with longevity of your work. It's not hard, you really can do this! So, what do you think? Are you ready to try this? I have a complete set of painting lessons that explain in even greater details how to paint realism. Check out my eBooks and a DVD that shows you step by step how to do this! Now that you have a few oil painting basics and concepts that you can refer to as you surf the site, and delve deeper into this wonderful medium, drop me a line here, or sign up for the e-zine on the upper left to get my updates to the site! You'll get the latest demonstrations I post to the site, and sometimes the great examples folks send me.